Synopsis: In their only cinematic pairing, screen legends Marlon Brando (The Godfather) and Jack Nicholson (One Flew Over The Cuckoo's Nest) are a dynamic star combo who set the screens ablaze in this intense and startlingly realistic western classic from director Arthur Penn (Bonnie and Clyde). Montana Badlands rancher David Brazton is a self-made man, through years of tireless effort and determination; he has transformed his vast and rugged land into a thriving, prosperous empire. 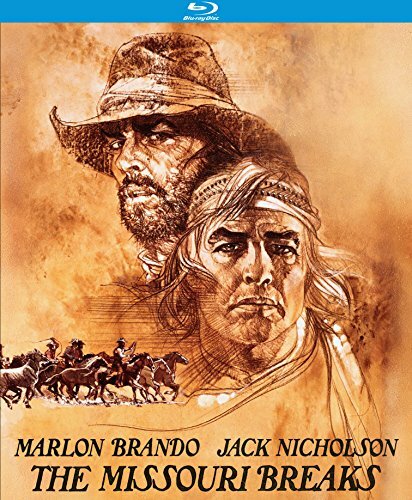 So when his livestock, fortune and family are threatened by a ruthless horse thief (Nicholson), Braxton takes matters into his own hands by hiring a sadistic bounty hunter (Brando) to track down the outlaw. Braxton intends to liberate the territory from crime, but what he initiates instead is a complex series of events that result in brutality and savagery far beyond anything he ever thought possible. Co-starring Randy Quaid (The Long Riders), Frederic Forrest (Hammett), John P. Ryan (Avenging Force) and Harry Dean Stanton (Paris, Texas), scripted by Thomas McGuane (92 in the Shade) and shot throughout majestic Montana, the Missouri Break is every bit as powerful and affecting as its dynamic leading men.